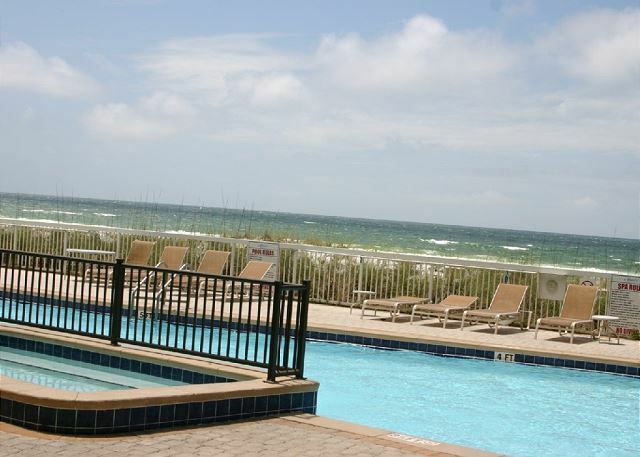 Newly renovated with upscale and tropical decor, you immediately have a Floridian beach feel at this first floor unit! You are captivated by the panoramic ground/1st floor ocean view via the extra large 28 patio with floor to ceiling glass doors spanning across the living area and master bedroom. 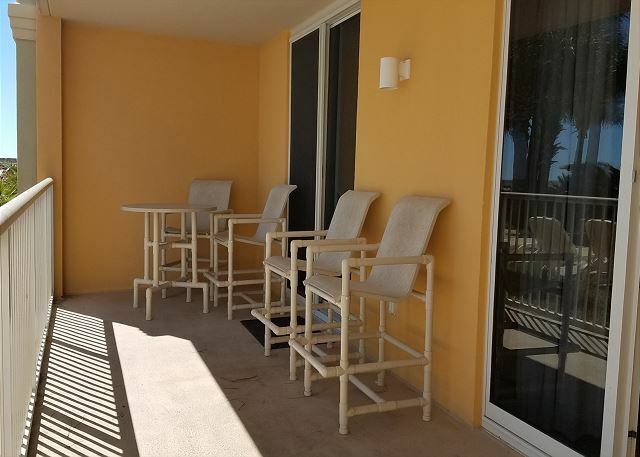 There is an elevated bar stool height patio table and chairs for your enjoyment. The view of emerald, blue waters breaking against 515 sugar white sand beaches takes your breath away, especially at sunset! There is a great view of dolphins swimming through crystal blue waters. 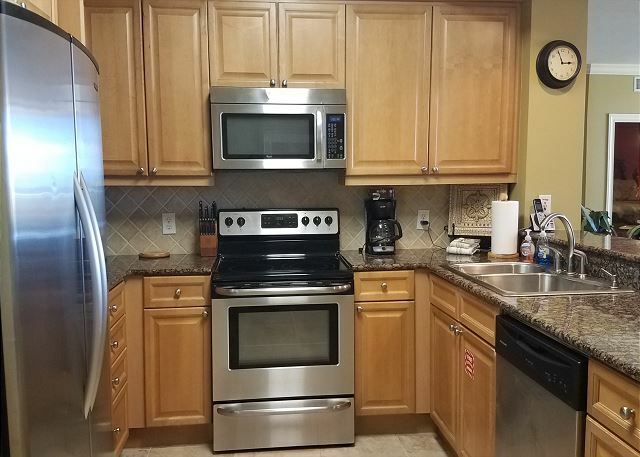 The kitchen is full of everyday amenities and lined with beautiful granite counter tops, a breakfast bar for four, and stainless steel appliances. 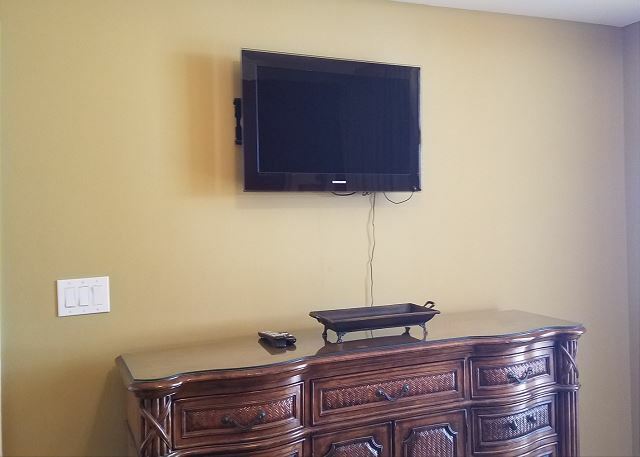 There is state of the art technology; 55” LED/LCD wall mounted flat panel HDTV. 9’ ceilings with crown molding and floor to ceiling mirrored glass throughout dining and living area for a more spacious and luxurious feel. 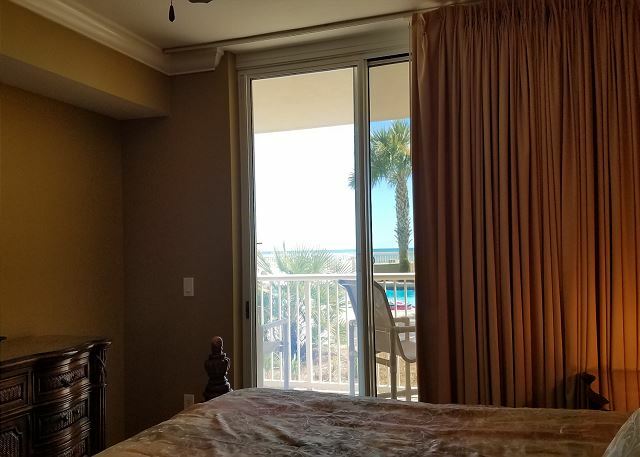 *Gulf Front Master Bedroom – A fabulous master suite with a great views of the beach and the sounds of the surf easing you to sleep! 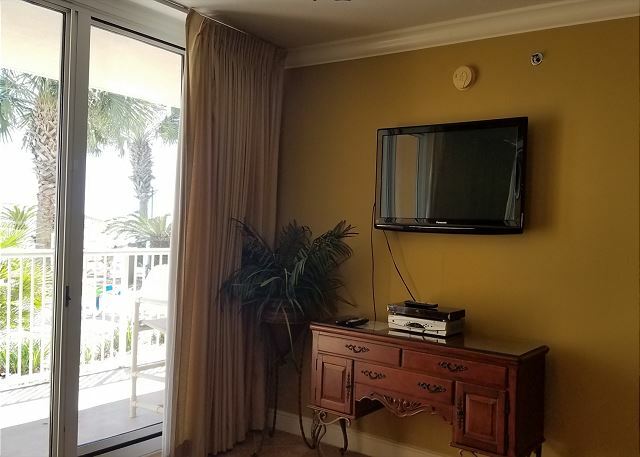 There is floor to ceiling sliding glass door for private balcony access where you can enjoy your morning coffee or sunset cocktail. 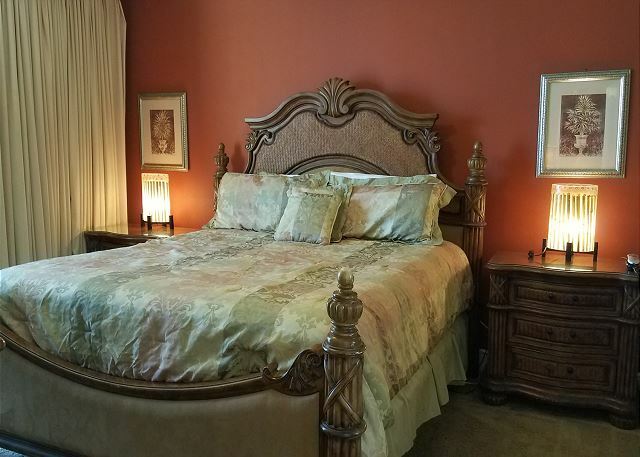 The master has a king bed with beautiful beach inspired palm linens with warm colors to soothe you. 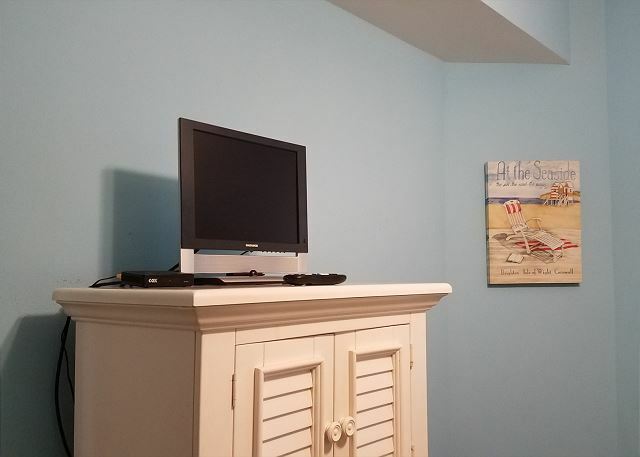 27” TV, chest of drawers, chair with reading lamp, two night stands, alarm clock, and phone. 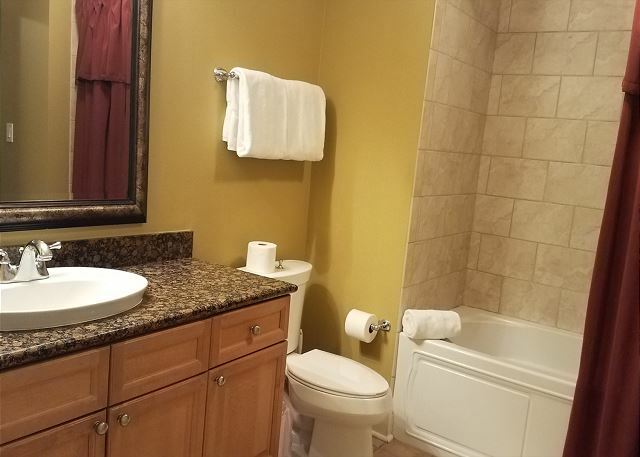 You’ll enjoy the spacious master bath with separate walk in shower and 2 person Jacuzzi tub, granite counter tops with double sinks, linen closet, and private bathroom. Two closets for his and her. 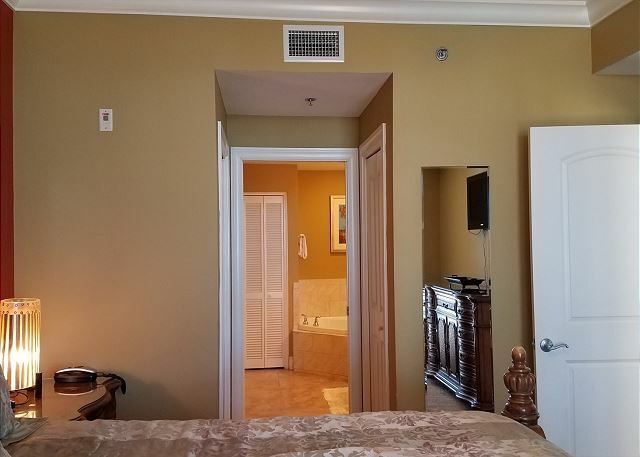 (Sleeps 2) *Guest Room 1 - Tommy Bahama feel with a Queen bed, luxurious warm colored linens, two nightstands, 27” TV with chest of drawers, dressing mirror, large closet and attached to large private bath with tile, tub, and hall access. Phone and alarm clock. (Sleeps 2) *Bunk Room – A kids dream! 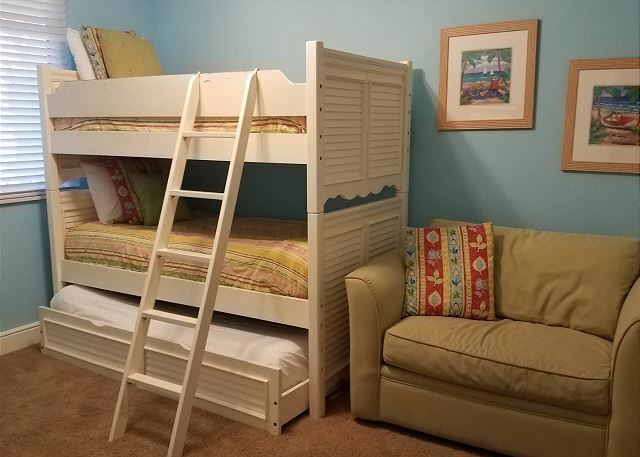 This bunk room is all your kids need to see to choose “POOLSIDE” as your next beach getaway! Single size bunks with Single pull out trundle & single fold-out sleeper sofa able to accommodate 4 adults or kids. 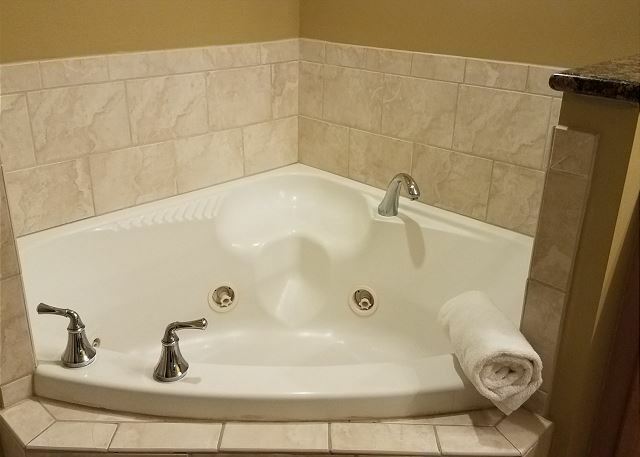 There is a flat screen TV and DVD in bunk with cable, chest of drawers and large closets w/ private tiled bath including a full size tub/shower with granite counter tops and a linen closet. Bright and cheerful linens and beautiful ocean blue walls are abound. 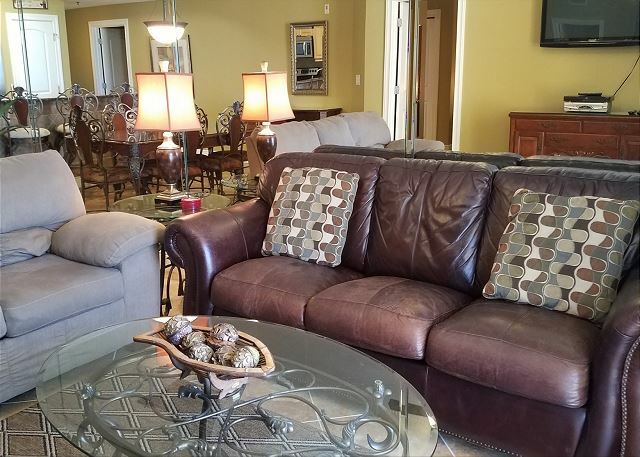 (Sleeps 4) *Living Room – Casual but elegant décor, large leather sleeper sofa(sleeps 2) with chair and large oriental area rug over tile. State of the art technology; 55” LED/LCD wall mounted flat panel HDTV. 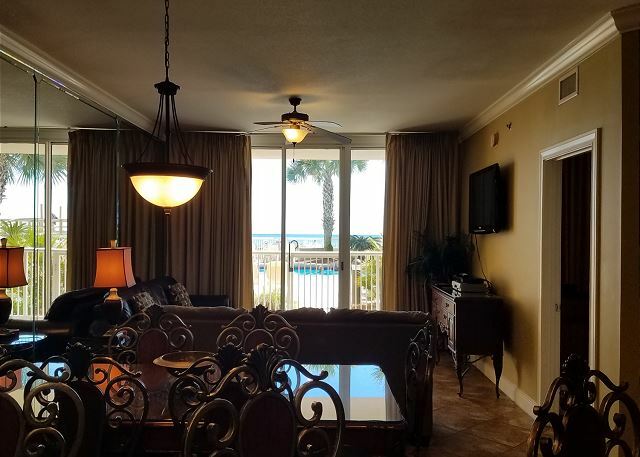 Gulf front views, beautiful 9-foot ceilings with crown molding and gorgeous 18” diamond patterned floor tile from kitchen to sliding glass door. A wall of floor to ceiling mirrors opens up this large floor plan even more throughout dining and living area. Computer ready workstation with High Speed wireless internet. 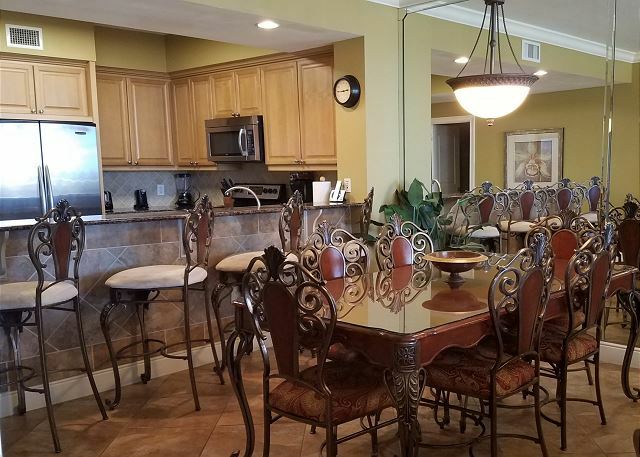 (Sleeps 2) *Kitchen/Dining - A fully equipped gourmet kitchen with bar seating 4 and separate dining area with seating for 6. 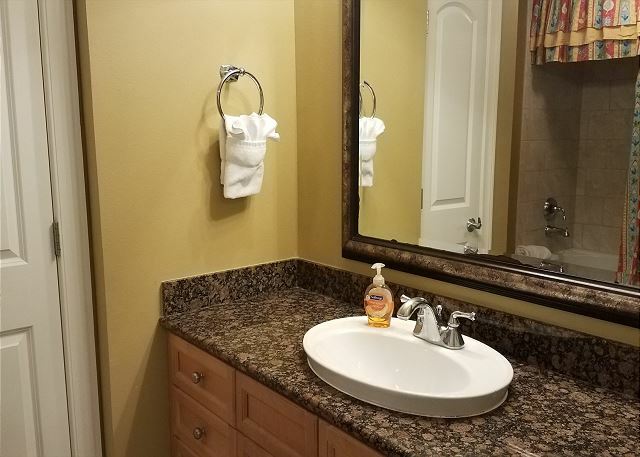 Large 18” tile throughout, with beautiful diamond patterned tile backsplash above counter tops and on back of breakfast bar. 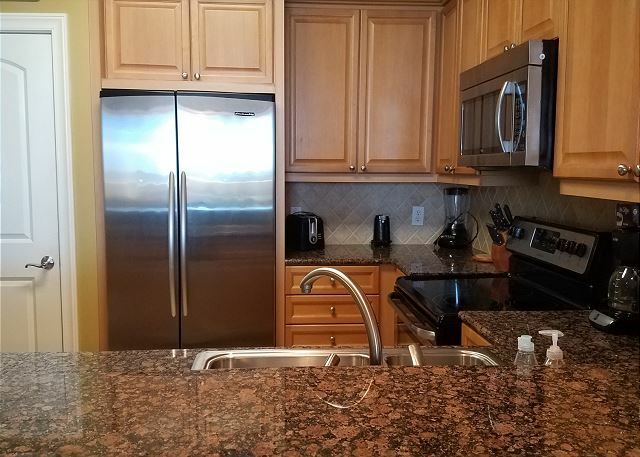 Beautiful granite counter tops and state of the art stainless steel KitchenAid appliances with all essential small appliances and Maple cabinetry. Full size pantry closet. 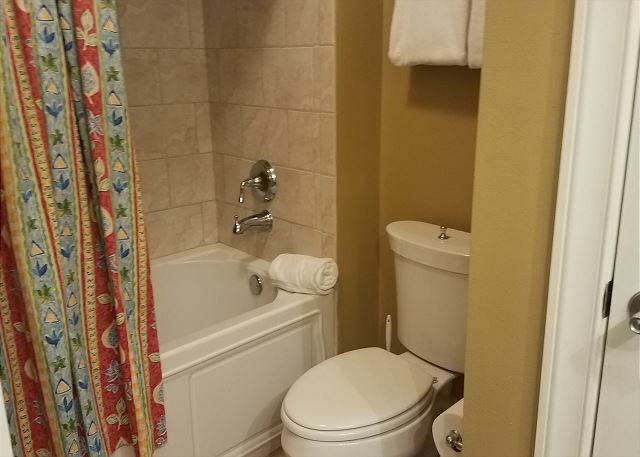 *Laundry Room – Full size large capacity washer and dryer, wire shelving above washer dryer for extra storage. Iron board and iron, mop, broom. Just as they say, we had a awesome stay hurricane hit just 50 miles away and things were great no effect from the storm. The people at Beachin Destin were honest and mad our stay great. We’re planning to go back next fall. I’m 53 and **** I know now why people retire in Florida. Thanks for the great review. 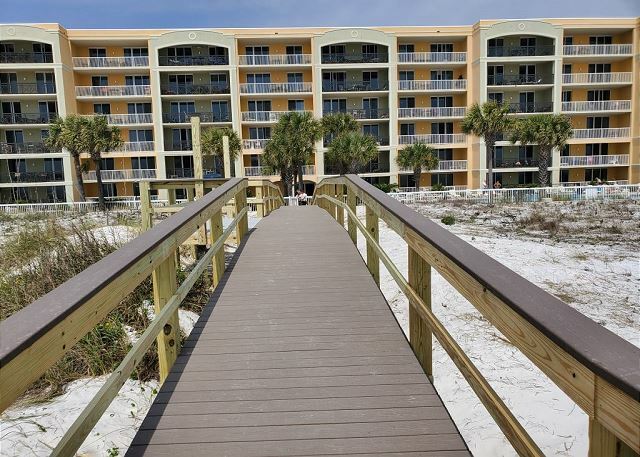 We feel very fortunate that none of our properties received any damage from Hurricane Michael. It was a great trip, great room lots of space direct beach access and will book again. Right on my he Beach close to everything. The rooms colors and decor were great for families my photos. Thanks for the great review, and I hope we see you back soon. Our rental unit was on the first floor..opening up to one of the large pool areas which was wonderful! 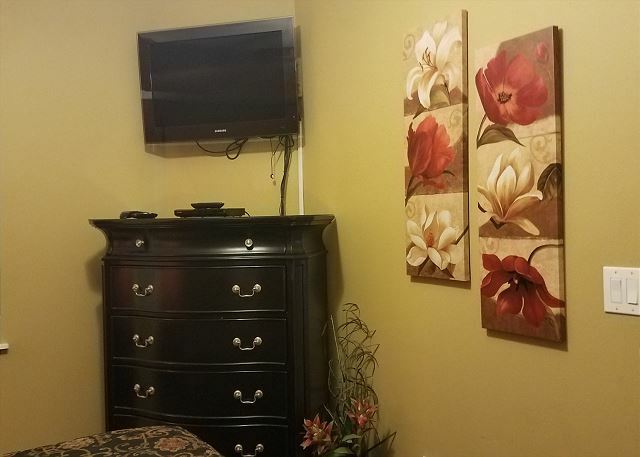 The unit was clean and spacious, the bedrooms were large and had plenty of drawer storage plus large closets in each. 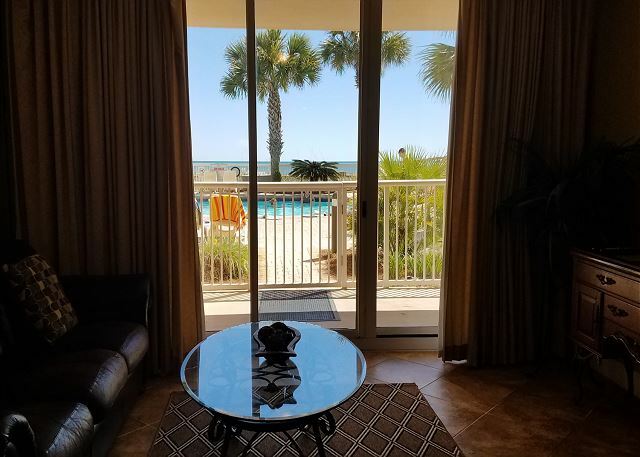 My husband and I along with our daughter and 2 small granddaughters thoroughly enjoyed staying with Stacy and Beach’n Destin and plan to reserve this unit next year should our World Series be in Fort Walto again. Thanks for the great review. The pool access is always a hit with families. 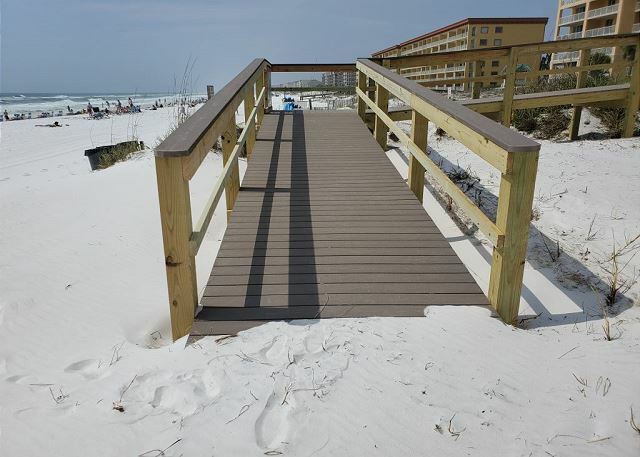 I hope they pick the amazing town of Fort Walton Beach again so we can see you back down here. Thanks for the review. 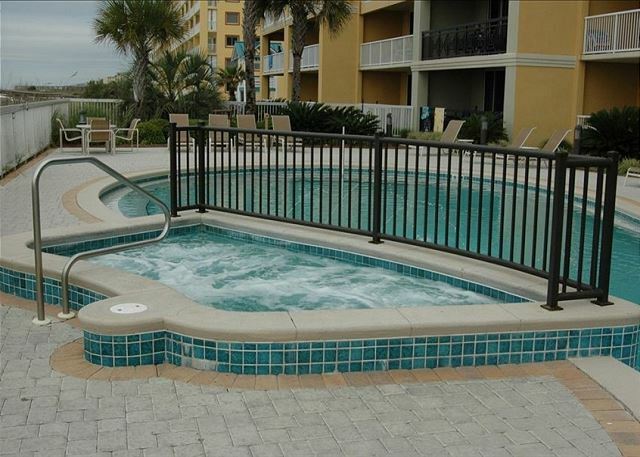 The pool access is really what sells this unit, and I am glad your family was able to enjoy it. I hope we will see you back again in the future. We get quite a few return guests to this Azure Pool Access property. I hope we will see you back again for a third time. 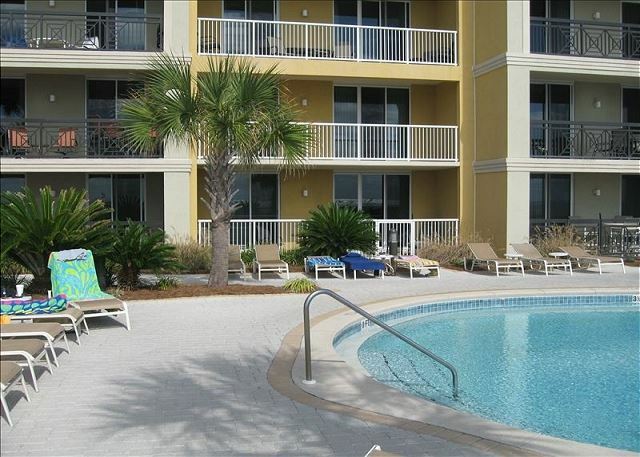 This ground floor pool & easy access beach unit is outstanding! All bed rooms were nicely decorated, very clean, and comfortable. 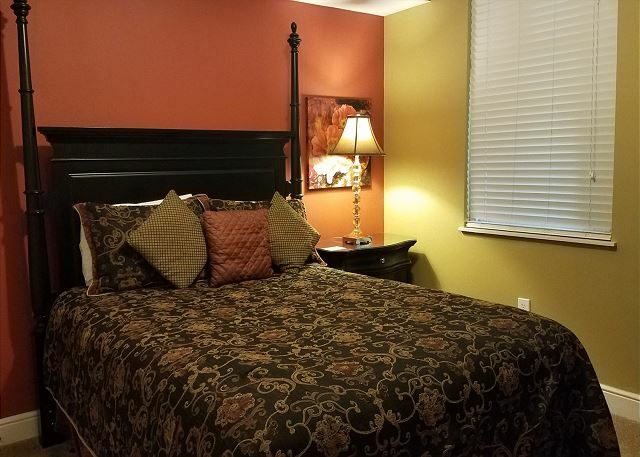 The master was has plenty of room with a king bed ,flat screen , and large closet and bath area. Bedroom 2 queen bed comfortable and spacious for my married adult kids. The bunk room had bunk with trundle plus a chair pullout twin bed. Patio has high top table and 4 chairs. Great set and location. Very clean and safe complex. Only thing I would think about adding is the chairs and umbrella on the beach. Many units include it we found out with talking to others on the beach/pool. 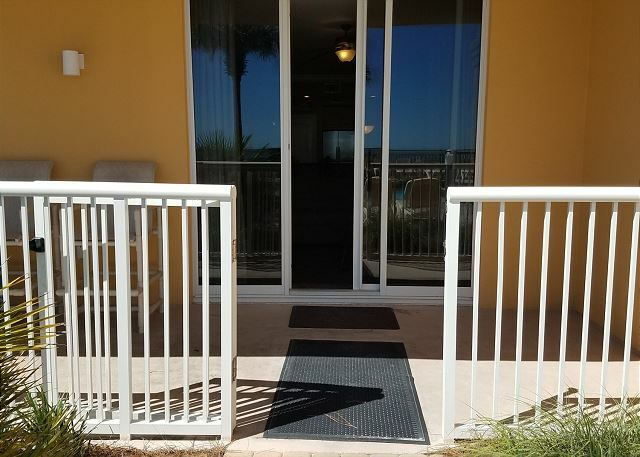 We will return and do our best to use this condo again. Beautiful location and accommodations! The rest of our party stayed and the Wyndham Garden. They were very envious! 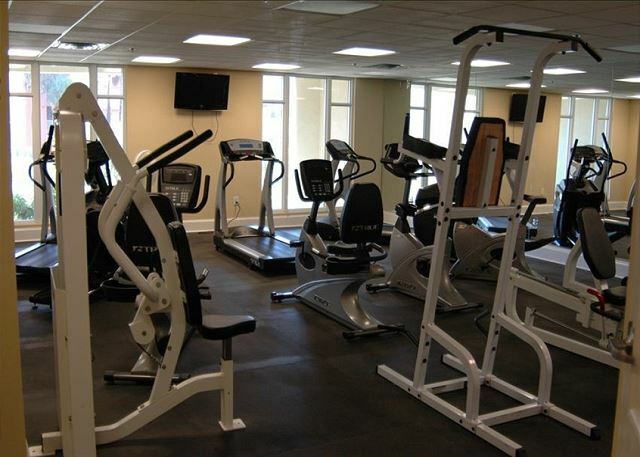 Looking for convenience, this is the place! We had never stayed on a ground floor unit and after this vacation we will never not stay on the ground floor. This unit was so convenient! 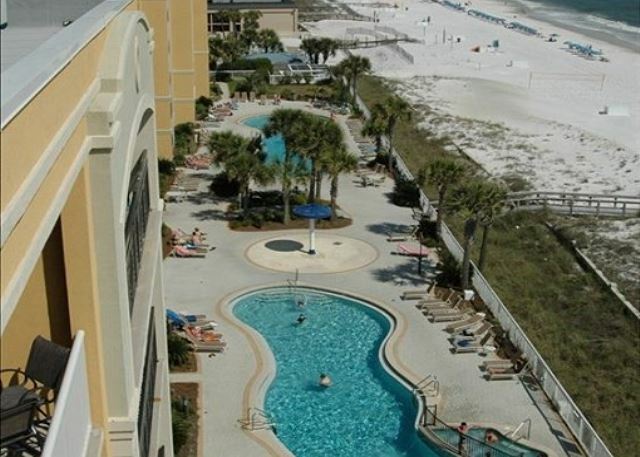 It was convenient to the pool, the beach and the parking garage. No stairs and no long lines at the elevators. This was especially helpful for us with a 5 month old, 2 year old and 11 year old. We had lots of beach items and they were easily towed. When were finished we could just rinse them off and throw them on the patio and walk inside. We could also use the baby monitor from the pool at nap time. Such a great experience! We had also been concerned about the noise at night on the ground floor being so close to the pool, but there was never any issue. The staff were there at 10pm to close up. Everyone seemed very family oriented too, so even if they hadn't I don't believe it would have been a concern. 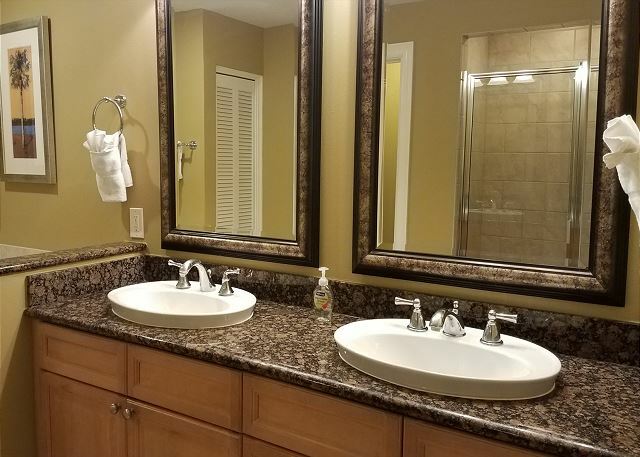 The unit was beautiful and spacious! Master bed was super comfortable. We even tried to look and see what brand it was because we wanted one! The only thing I can think of we needed throughout the whole week was Tupperware to put leftovers in and chip clips. We had everything else we needed. Thank you for a wonderful stay! We hope to be back soon! 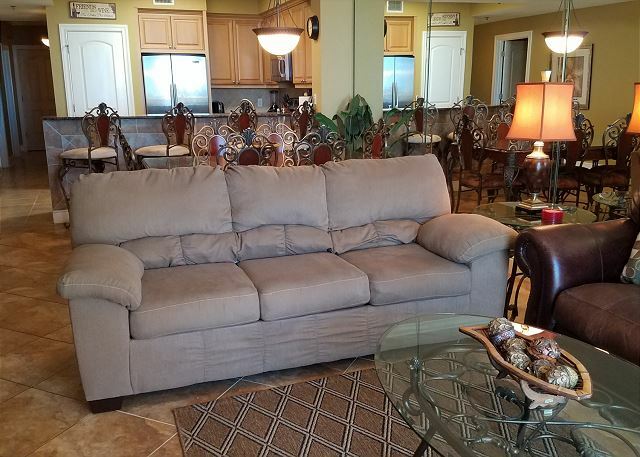 This condo was wonderful! The location is great and exactly what we had hoped for. It was well stocked with all the amenities of home. We will definitely stay here again! 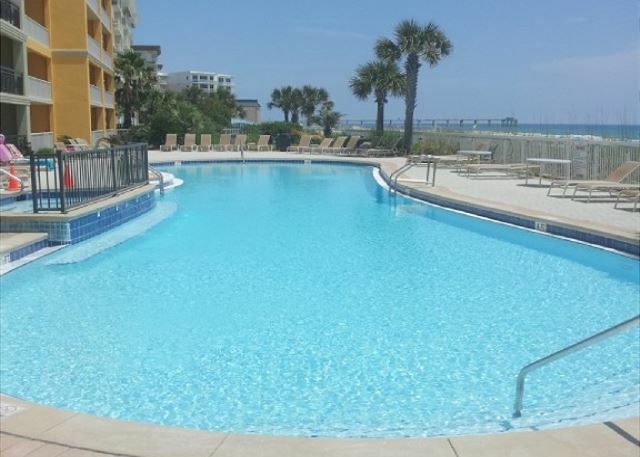 Great waterfront condo with direct access to pool! 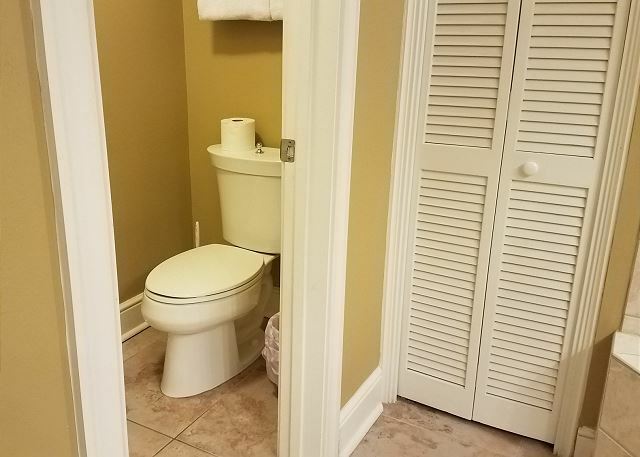 We totally enjoyed the convenience of the location of this condo. The pool was right out the gate on our patio! Great for kids! My only complaint about this condo is it needs a new dryer. Had to run 2 cycles to get clothes dry. And another large pot would be helpful. We had a great time. 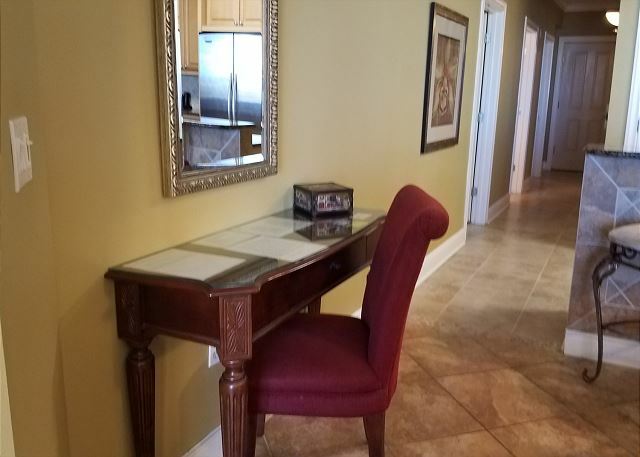 Great condo.